SINN FÉIN HAS published its motion of no confidence in the Government, which calls on the Taoiseach and all the Cabinet ministers to resign. Sinn Féin published the motion this morning and it is due to be voted on in the Dáil on Thursday. The party announced over the weekend that it had submitted the motion in the wake of the controversy surrounding garda whistleblower Maurice McCabe. 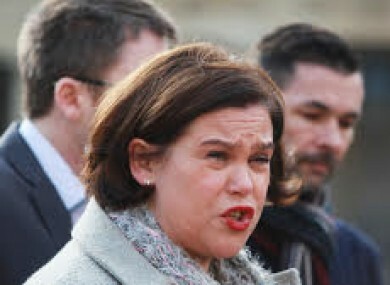 “People the length and breadth of Ireland are rightly outraged by what has transpired over the course of the last week,” said Sinn Féin deputy leader Mary Lou McDonald. “The government is clearly unable to deal with the major issues facing our people. The text of the motion reads that the failure of Government ministers “to protect the interests of Garda McCabe” went to “the very heart of the integrity of this Government”. Sinn Féin has called for all opposition TDs to support the motion on Thursday. For Fine Gael to survive the motion they will need Fianna Fáil to abstain from the vote. Fianna Fáil members yesterday said that they would abstain from voting and that the decision will be formally ratified by the party at its meeting tomorrow. However, now a full-scale political storm is also brewing between the two parties, with both Jim O’Callaghan and Justice Minister Frances Fitzgerald having two completely separate versions of a conversation that took place between them on Wednesday evening. A clear division has emerged between the two parties over whether or not Justice Minister Frances Fitzgerald knew about the issues between Tusla and Maurice McCabe before last Thursday’s Prime Time broadcast. Email “Sinn Féin publishes motion of no confidence in Government”. Feedback on “Sinn Féin publishes motion of no confidence in Government”.